Every US registered aircraft must be inspected on a regular basis. For most general aviation aircraft this is an annual inspection. Aircraft used for hire (most flight training aircraft) are inspected every 100 hours. In very basic terms the inspector is looking for two things: Is the aircraft safe to fly and is the aircraft legal to fly. They are very different concepts and an aircraft can meet one of these conditions but not the other. Point Aviation uses the aircraft manufacturers inspection and maintenance checklists whenever possible. These are often augmented with specialized checklists from type clubs such as The American Bonanza Society or Twin Cessna Flyers. Detailed FAA Airworthiness Directive research and tracking is accomplished using software that is updated daily. During the annual/100 hour inspection the aircraft is “opened up” to the extent necessary to properly conduct the needed inspection requirements. This varies greatly between aircraft models. Airworthiness Directive (AD) applicability and compliance is researched and verified. The aircraft is checked for compliance with it’s FAA Type Certificate for required equipment and placarding. Supplemental Type Certificate (STC) installations are researched for proper installation and separate specialized inspection requirements. During this process routine lubrication and servicing is usually accomplished. Point Aviation encourages owners to assist during the inspection as it is a great way to learn about your aircraft. All amateur built experimental aircraft must have an annual “condition” inspection very similar to an “annual” inspection. This inspection can be performed by the original builder who is or was in essence the “manufacturer” of the aircraft or a certificated Airframe and Powerplant Mechanic. 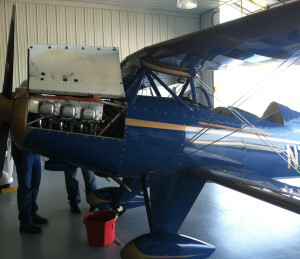 The aircraft is inspected to verify that it is in “condition for safe flight”. Airworthiness Directives are not issued against these aircraft however there may be AD’s that should be looked at that apply to engines, propellers and other accessories installed on the aircraft. The aircraft’s airworthiness certificate may contain required equipment and/or placards that must be installed. A “pre-purchase” inspection is an inspection that is performed during the purchase of an aircraft. It can be as simple or as detailed as the parties involved require. The basic purpose is to ascertain the aircraft’s condition to the satisfaction of a prospective buyer. The terms and conditions of a pre-purchase inspection should be agreed upon by both buyer and seller before the inspection begins. These are somewhat specialized inspections that are used to ascertain an aircraft’s conformity to their Type Certificate before a US Airworthiness Certificate can be issued. An example we saw some years ago was a Piper Cherokee being brought in from Canada. It had originally been built for export to Canada and had a carburetor installed that did not conform to it’s US Type Certificate. This required only the proper model carburetor to be installed to achieve conformance. Another example is the T-42A Beech Baron. These are a military variant of the B55-B Baron that were built under military contract. They cannot be issued a Standard US Airworthiness Certificate unless a specific Beech Modification Kit is installed. "Aviation in itself is not inherently dangerous, but to a degree even greater than the sea is terribly unforgiving of any carelessness, incapacity, or neglect."